Easter is an intriguing time of year. It is the most important Christian festival, celebrating the death and resurrection of Jesus Christ. The English name for the festival is possibly take from the name of the pagan goddess, Ostara, who may or may not have been a goddess of the dawn. 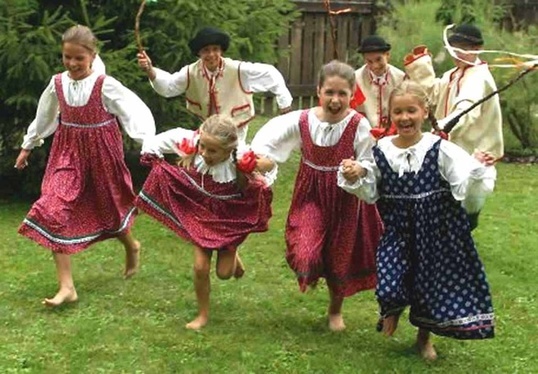 For most of the western world, this most solemn event is celebrated by consuming chocolate eggs, supposedly delivered by a magical rabbit but other traditions around the world include egg-tapping (or egg-knocking), well-dressing and whipping the local girls. Easter is a festival that seems to eclectically draw customs to it that couldn’t find a home at any other time of the year. Thankfully, fairy tales offer us some insight as to what links some of these strangest of customs to Easter. The Brothers Grimm collected a tale that, although told to them by a German native, probably has its origins in Slovakia. Korbazka the Lazy is an odd tale. Korbazka is a lazy but lucky man. He is late in ploughing his fields but, when he does, he finds a cache of buried gold. He is too lazy to carry it home and so it remains safe when the village is attacked by robbers. He shares his wealth with the robbed villagers (he’s lazy, not selfish) and, in turn, he is given the prettiest maiden in the village as his wife. Soon, she falls pregnant but it transpires that Korbazka’s unborn son is as lazy as the father. After nine months, the baby shows no sign of emerging. A whole year passes and still the baby refuses to be born. Korbazka begs the baby to emerge. He attempts to bribe it with sweets. Nothing. Three years pass. Finally, on Good Friday, in utter desperation – don’t try this at home! – he whips his wife’s belly in an attempt to force the child out. Nothing. In fact, the baby is utterly still and Korbazka fears he has killed his son. Fearful and penitent, Korbazka confesses to the priest and is baptised anew in the icy local river. And then, as the light of Easter Sunday dawns, Korbazka’s son climbs from his mother’s womb, as big as a three year old and already able to walk and talk. The parallels with the story of Jesus are obvious. My sympathies (along with yours, I suspect) are with the poor mother who not only had to suffer a three year pregnancy and a whipping by her husband but then had to give birth to a full-sized toddler. Strange and downright immoral though the tale may be, it is a possible explanation for the strange Easter customs of the Czech Republic and Slovakia which involve the young woman being symbolically whipped by the men and then the men – or in some places, the women – being doused in icy cold water. 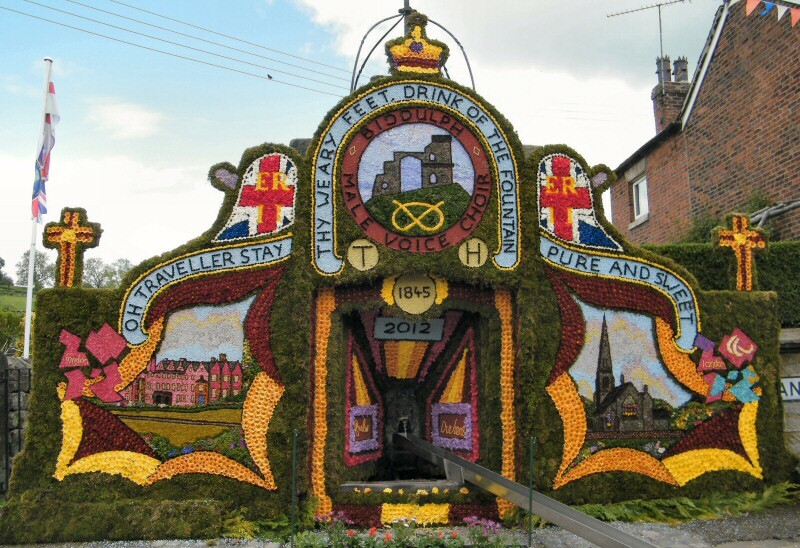 Well dressing is a sweet little springtime tradition that can be found across central England, particularly in Derbyshire. It involves the creation of colourful plaques or sometimes embroidery which are then used to decorate (or ‘dress’) the local well. Its origins are unclear but more than one scholar had pointed to the tale of Ozric Tentacles as a possible influence. Ozric Tentacles is, as far as this writer is aware, the only fairy tale to feature a squid. The story starts with a Derbyshireman who decides to seek his fortune at sea. This is unusual, given that Derbyshire is just about as far from the sea as one might get in England. His neighbours and friends deride him for his foolish notion and tell him that nothing good will come of it. He tells them that he will come back, not only with a story of his own but with a gift for all the local sheep farmers. Off goes the Derbyshireman, sets sail from Bristol and, before the year is up, is shipwrecked. The next bit is weird and will be swiftly glossed over here. The Derbyshireman meets a squid, falls in love and they have a baby boy. The boy is called Ozric (it’s an old English name meaning ‘power’) and he is called Ozric Tentacles because, well, he has tentacles. The romance between a man and a squid was always doomed to fail. The Derbyshireman dies, defending his squid bride from pirates, and young Ozric realises he must move on. Fed on his father’s stories, Ozric decides to return to the motherland and visit the hills and dales of Derbyshire. He comes to England to find the land in the grip of drought. Crops have failed across England, the grass has shrivelled up in the sun and the sheep farmers of Derbyshire can only watch as their flocks succumb to starvation and thirst. Along comes Ozric. The locals, sadly, do not look at him and think to themselves ‘ah, here comes an interesting young lad, his tentacles a-waving. Let’s buy him a drink and have him tell his story’. No, the Derbyshire folk see Ozric and his tentacles and, terrified, set upon him with pitchforks and axes. They hack and slash at him and, as each severed tentacle falls away, a wellspring appears where it touches the ground. Ozric falls down dead but now, across the valley, fresh wells have appeared giving water and life back to the struggling people. In penance and gratitude, the people build a church in Ozric’s memory and garland the wells he created with the flowers that have now sprung up once more. A saviour killed by those he will save. Life coming from death. Again, the religious imagery of Easter is clear here. In researching this piece with the help of Dr E. Alexander of Sheffield University, we tried to find Ozric’s church in Derbyshire but, despite some helpful advice from a publican in Hathersage, we only found a square outline in local stone in the woods. It might have been the ruins of a church. It might just have been the remains of an old sheep pen. Finally, a short tale and, for once, a fairy tale from the United States. The pioneer days of America were the source of numerous legends, perhaps the most famous of which was that of Paul Bunyan, the giant lumberjack who was usually found in the company of the equally giant Babe the Blue Ox. Less famous is the story of Egg-Tapping Tam. This is, without doubt, the source of the American tradition of egg-tapping which, not unlike the British game of conkers (but with eggs, not conkers, obviously) involves bashing your egg against a competitor’s and trying to break their egg, not yours. Tam was a settler in the East but not a prudent fellow. The chickens he raised on his farm, he ate. He kept no eggs, either to eat or to hatch new chickens from. A chicken farmer like that would soon be out of business and indeed was the case for Tam. His farm destroyed, his home taken from him, Tam wandered the land as a vagrant. One night, he sat by a fire with a stranger, who turned out to be a fairy (or an angel in some retellings, or indeed a tohopano spirit creature according to at least one anthropologist). The fairy, seeing Tam brought low, asked what was the cause of his misery. When Tam explained, the fairy burst out laughing at the foolish man. His greed had made him consume all his chickens yet never consider the food or profit to be gained from eggs. The fairy cursed Tam, declaring that he would never ever be able to open or eat an egg again. This curse had little impact on Tam until the day he wandered into a town and was offered a boiled egg as payment for some small service. Tam attempted to peel its shell but it would not give. He tried to smash it on the ground but it would not break. The townsfolk were amused by this man who was seemingly too weak to break an egg. A woman showed him how it was done but he could not do the same. The egg in his hand was like a stone. Another egg was held out to him and Tam bashed his egg against it, breaking the other’s shell but not his own. This curious event drew some interest. Whichever egg Tam picked up would stay whole, while every egg he struck his against broke. Soon, challengers came to try their hand against egg-tapping Tam but the man could not be beaten. His egg – any egg he held – would best another. Tam later travelled the land, his fame preceding him, and everywhere he went he would win egg-tapping competitions and preach to the people about the importance of prudent farm management. It is said that he was responsible for helping spread arable farming as far west as the Dakotas and spent his final days as a pious missionary amongst the Native American nations. Disenchanted, the latest novel by Heide Goody and Iain Grant does not feature any whipping, any mistreated squid-men or any egg-tapping contests. However, it does feature plenty of other nonsense and is, allegedly, very funny.